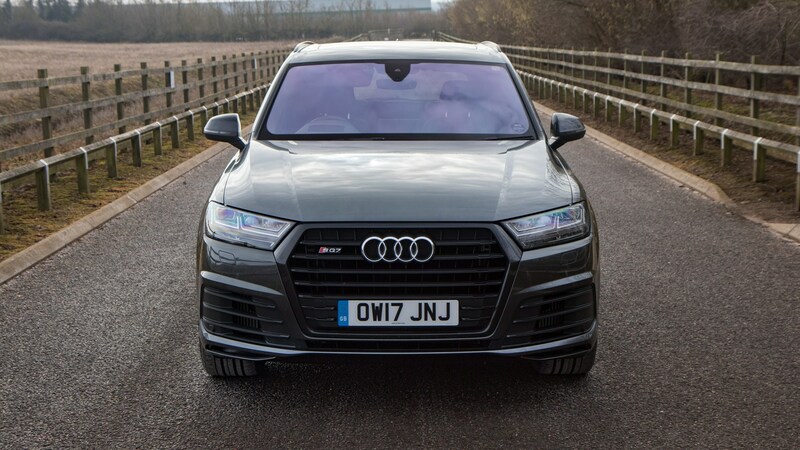 Some cars are big, some are fast – but some like the Audi SQ7 break the rules and decide to do both. Audi’s hot-SUV is based on the regular Q7’s MLB modular architecture and uses a 48-volt backbone that powers both an active anti-roll set up, and a third compressor for the SQ7’s 4.0-litre diesel motor. 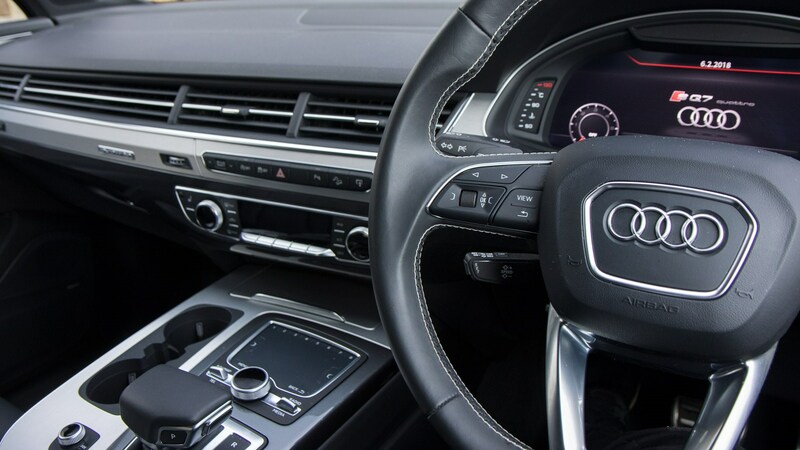 Throw in Audi’s advanced headlight tech, Virtual Cockpit and infotainment systems, and you’ve got a car that wants to be both responsive and techy. So just what is the Audi SQ7 like? Is it a peanut butter and jam, best of both worlds delight – or is its mixture of technology and power a recipe that doesn't gel? To find out, read the CAR magazine review of the new Audi SQ7. New Audi SQ7 review: what's it like to drive? 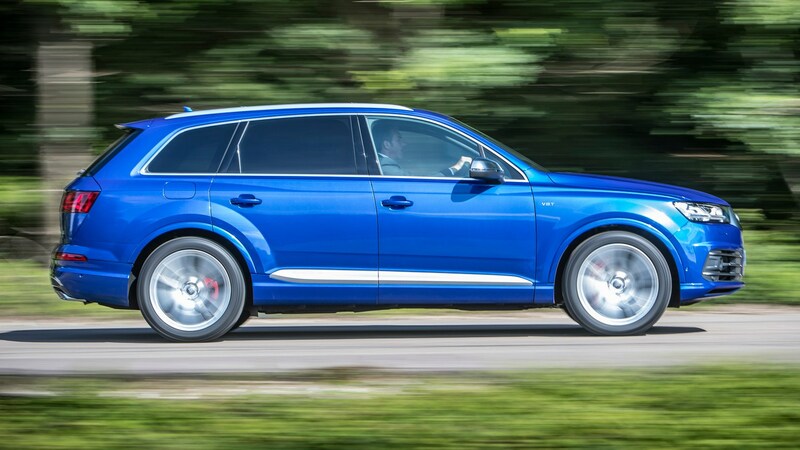 Basically, the SQ7 sounds like a V8 and goes like a V12. The diesel engine absolutely dominates the experience.The electric compressor exists to fill in any holes in the response time of the V8’s two conventional turbos off idle, which are already plumbed in sequentially but still rely on exhaust gases to build boost; the EPC simply pulls power from the SQ7’s new 48-volt electrical system whenever it needs to spin up, meaning it hits 70,000rpm in about a quarter of a second, sending a short pulse of motivation into the intake to help get the party started. You never get bored with the near-instant throttle response and the accompanying torque tsunami. It does a very good job of feeling like a 12-pot thanks to the extra flexibility afforded by the third blower; clearly this actually works (unlike those hairdryer-spec items advertised on certain popular auction sites...), albeit only at very low rpm compared to conventional turbos. Its not-inconsiderable task is to help get the 2.3-tonne SQ7 moving in the first place, rather than supplement the prodigious performance already on tap. The noise it makes is also to be applauded. It’s a dirtily purposeful V8 burble at lower speeds. Your neighbours will love it in the morning. Probably. New Audi SQ7 review: what about the performance? The performance of the new Audi SQ7 is... mind-bending. Put it into Dynamic mode and the claimed 4.9-second dash to 62mph seems eminently believable, which truly is remarkable because the Q7 is a huge SUV. This setting also shunts the active roll-stabilisation system into its stiffest setting, resisting the wallowing evident in softer modes eerily well. It corners so flatly that it’s almost incomprehensible. Your mind expects pitch and roll, yet the car delivers very little of either. You could play fantastic tricks on your six passengers if you switched modes without them noticing. Said powered anti-roll bars come as part of the snappily titled Driving Dynamics Sports Pack, which also includes a sports centre diff (try as we might, we couldn’t sense this working, such is the sheer grip and traction on offer on our blast through the narrow lanes of the Cotswolds) and rear-wheel steering, so it’s easy enough to park the thing once you’ve scared yourself silly. In fact, we found ourselves driving the SQ7 in Dynamic for the majority of the time. It’s a little on the firm side like this – the air suspension struggles to maintain the SUV’s composure over lumpy roads – but everything else seems to be far better. The steering in particular really needs the extra weight of the sportier driving mode, because out of the box it’s so wildly over-assisted that it’s difficult to judge its response. You want to feel in control with this engine under the bonnet; and since you’ve paid for it, you might as well have it turned up to 11 while you’re driving. New Audi SQ7 review: and the interior? We suspect this is one of those ‘because they can’ kind of deals. Only a sadist really needs a seven-seater SUV that can out-sprint all but the three most potent hot hatches currently on sale before attempting to out-corner them. The visual makeover is likely to be as endearing to other motorists as Jeremy Clarkson at a Greenpeace convention, the interior is finished to a high standard but totally devoid of charisma, and despite the 70 grand price tag you still need to spend more to make it really behave like an animal. Clearly this seven-seater S car isn’t a particularly relaxing machine, then, but it doesn’t have to be that way. The real spec secret in the Q7 line-up is actually the e-tron version, which is a plug-in hybrid. We found it better to drive, far more refined, cheaper and miles better on fuel. Oh, and it’ll still sprint from 0-62mph in 6.2 seconds. Do you really need your SUV to go quicker than that? How many races do you get into in while waiting for little Crispin and his mates to finish their polo lessons? You’ll sacrifice a pair of seats to make way for the batteries, but the boot’s still usefully cavernous. The e-tron also packs a very entertaining kick-down function that unleashes all 338bhp and 516lb ft on offer in one go, and thanks to the electric motor’s assistance it feels like that bit in Star Trek where the Enterprise makes the jump to warp speed. But slow it down and it’s a seriously serene machine – especially running in silent EV mode, which it can do for a claimed 35 miles. Audi’s stated 157mpg average is frankly unlikely, but 80mpg certainly isn’t out of the realms of possibility. Compared to the SQ7 we tested, which clocked in at £95,160 with options, the e-tron looks a veritable bargain priced at £64k. Audi reckons sales figures will favour the S, but we reckon the plug-in’s preferable. A colleague described this car as physically impressive but difficult to love. We’re not so sure – there’s just something so hilariously endearing in the way this massive bus can charge along a twisty bit of road that it might just ignite the spark of permanent passion. Perhaps not least because in spite of all its toys, this is still borderline madness and requires a fair degree of input from the driver to manage and maintain. And in isolation the SQ7 is a wonderful thing. It’s a total techfest and certainly houses one of the best (and most interesting) motors you can currently buy. It’s a reflection of the way electrification is barging its way onto our roads, however, that the more compelling car in this instance has a plug.